Does anyone have any statistics on the number of scientists (Ph.D.-level researchers) who are Christian? This question does not appear to be about Christianity within the scope defined in the help center. We found the highest percentage of belief [in God] among NAS mathematicians (14.3% in God, 15.0% in immortality). Biological scientists had the lowest rate of belief (5.5% in God, 7.1% in immortality), with physicists and astronomers slightly higher (7.5% in God, 7.5% in immortality). 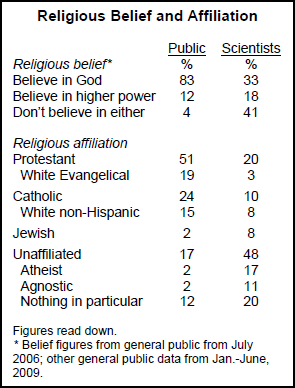 In regards to the question being asked, however, a Pew Survey in mid-2009 found that 33% of all scientists in America (not just those elected to NAS) believe in God, compared to 83% the American public. 18% believed in some sort of "higher power" (unaffiliated with any religion) and 41% are atheist. 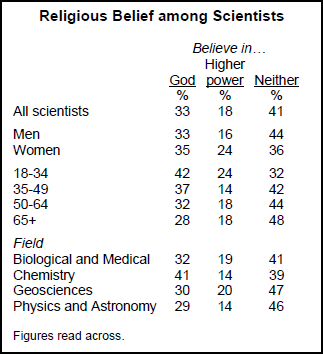 This suggests that the "average" scientist is more likely to believe in God than the most esteemed scientists. This interesting article summarizes some of the findings from the Pew data. You can look at this article: http://www.lhup.edu/~dsimanek/sci_relig.htm, and get a rough idea. I expect that the numbers will be lower now, in terms of those believing, since so many vocal Christians are so anti-science. Larson and Witham present the results of a replication of 1913 and 1933 surveys by James H. Leuba. In those surveys, Leuba mailed a questionnaire to leading scientists asking about their belief in "a God in intellectual and affective communication with humankind" and in "personal immortality". Larson and Witham used the same wording [as in the Leuba studies], and sent their questionnaire to 517 members of the [U.S.] National Academy of Sciences from the biological and physical sciences (the latter including mathematicians, physicists and astronomers). The return rate was slightly over 50%. Note: The 1998 immortality figures add up to more than 100%. The misprint is in the original. The 76.7% is likely too high. However, if you are searching for some fascinating scientific debate for creationism, I suggest viewing Ben Steins's "Expelled: No Intelligence Allowed" dvd. There are many interviews with respected scientists who believe in Intelligent Design; two of which I have named below and have added a brief biology for each. Received his Ph.D. in philosophy from Princeton University and was later a postdoctoral fellow in mathematics and molecular biology at Columbia University. He has authored works on systems analysis, differential topology, theoretical biology, analytic philosophy, and the philosophy of mathematics, as well as three novels. He has also taught philosophy, mathematics and English at such universities as Stanford, Rutgers, the City University of New York and the Universite de Paris. In addition, he has held research fellowships at the International Institute for Applied Systems Analysis (IIASA) in Austria and the Institut des Hautes Etudes Scientifiques (IHES) in France. Recent articles by Dr. Berlinski have been featured in Commentary, Forbes ASAP, and the Boston Review. Two of his articles, "On the Origins of the Mind" (November 2004) and "What Brings a World into Being" (March 2001) have been anthologized in The Best American Science Writing 2005 , edited by Alan Lightman (Harper Perennial), and The Best American Science Writing 2002, edited by Jesse Cohen, respectively. Received his Ph.D from Caltech and did post-doc research at Cambridge University, and published some of his findings in the peer-reviewed Journal of Molecular Biology. He was trying to see whether it is easy or hard to shuffle amino acids randomly in order to make functional proteins. Those JMB publications show that the number of functional amino acid sequences is tiny, compared to the number of possible sequences. Not the answer you're looking for? Browse other questions tagged science or ask your own question. Have Creationists advanced any particular Theories of Origin that they claim are falsifiable via the scientific method?